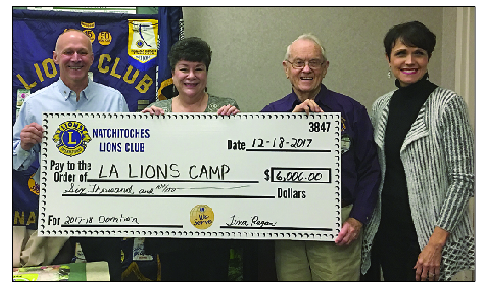 Natchitoches Lions Club made a $6,000 donation to the Louisiana Lions Camp for children with physical and mental disabilities and diabetic youth. This continued support is made possible through local fundraising efforts such as the Mother’s Day Rose sale, the fall pecan and fruitcake sale, the yearly flag project and the spring fish fry. Camp Director Ray Cecil received the donation from Lions President Dr. Cheryl Stoker. Lions Lisso Simmons and Tina Ragan participated in the presentation.